No matter where they are or what language they speak, the recipient of this unique gift basket is going to know you're grateful. 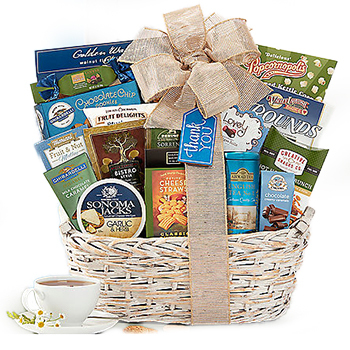 A keepsake gift basket loaded with a sampling of superior tastes including delectable Cookies, appetizing Crackers, Olives, Caramels, Nuts, and much more! When the time comes to express your gratitude to family, friends, or co-workers the World Of Thanks Gift Assortment is an ideal choice. PLEASE NOTE: Basket shape & design and exact brand selection may vary based on local availability at delivery location. ATTENTION: The cup is not included and is used for the decoration only.